GGotW: What got you started as a model? WF: I have always been artistically creative and basically treated myself as a canvas. When I was fifteen I was asked by photographer Kimberley Camilleri to model. She told me she liked the way looked and wanted to get it onto pictures. 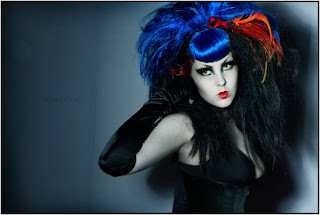 I liked to paint myself up and dress myself into whatever themes inspired me at the time and she loved to photograph them. It was a perfect relationship. I prominently modeled for her for a few months before she introduced me to photographer Peter Coulson who I mainly work with today. A lot of my pictures I have put up though were taken by Matthew Bush, mainly to model wigs I customized to sell. GGotW: What kinds of wigs do you do? WF: I mostly customize big theatrical wigs. I’m inspired a lot by wigs from the 16th century, though it may be hard to see the similarities. I love to have volume in my wigs and coloured sections. Making them involves bleaching, dying, cutting, styling and sewing. All the images that I appear to have explosive hair are 99% wigs I have customized. GGotW: Have you had the opportunity to work with a lot of photographers? WF: I have had the opportunity to work with a decent amount of photographers. I am actually fairly picky with the photographers I chose to work with as I need to feel I have a connection with them. There are too many photographs that are produced that don’t work because two artists reluctantly clashed their two visions together. GGotW: Is there a story behind the name; Winter Frost? WF: I use never leave the house during the day and because of that lost all colour to my skin. An old friend mentioned I had winter white skin and I guess I pinched it from them. Frost seemed to fit I guess. GGotW: What kind of works do you paint? WF: Whatever I am inspired by at the time really... I am really inspired by Roy Lichtenstein at the moment and am painting a comic fem fetal series. I also want to do an oil series based on the beautiful animal, Cheetahs. I am hoping to put together enough paintings to hold an exhibition at the end of the year. GGotW: As a dancer, where do you perform? WF: I have done Burlesque shows but mainly go-go dancing. I am dancing at Red Bennies in Melbourne (Australia) at the moment doing a few stage shows and go-go dancing. It’s a fun way to make some money. I have danced Jazz, ballet and even Contemporary too. GGotW: When you're not modeling or dancing what keeps you employed? WF: I don’t have a stable job if that’s what you’re asking. My arts are my life and how I make my living. I mainly make money through modeling and sell my paintings when I can. It always manages to get me by though I am getting hungrier to make a better living through my arts. I’m working on a variety of projects which I am hoping will get me more publicity leading to more work. She's definitely has some unique features-and yes that was a complement, what's her real name ?